L-Arginine Plus Raspberry 3-Pack Powdered Drink Mix for Better Blood Pressure, Cholesterol, Energy and More - #1 Heart Health Supplement by Elements of Health Care at Maximum Wellness. MPN: XW-A1OQ-SLUL. Hurry! Limited time offer. Offer valid only while supplies last. L-arginine Plus Cardio Health Formula is an affordable alternative to the expensive products first introduced by network marketing companies. L-arginine Plus Cardio Health Formula is an affordable alternative to the expensive products first introduced by network marketing companies. L-arginine Plus, Cardio Health Formula: Powder Supplement contains 5110mg L-arginine, 1010mg L-citrulline, as well as Vitamin B6, Vitamin B12, Vitamin D3, Vitamin C, Xylitol, Red Wine Extract and 72 trace minerals per serving. L-arginine Plus also contains Astragin which sets our product aside from all the competition! AstraGin is a 100% All Natural ingredient blend of two highly fractionated plant extracts, Panax notoginseng and Astragalus membranecous. This ingredient has been demonstrated to promote the absorption of amino acids up to 66%. When manufacturing L-arginine Plus, our company decided to use only the very best ingredients. We wanted to do more than make a similar product at a better price. We chose instead to make what we believe to be a superior product at a superior price. Because of that commitment, we buy only the highest-grade ingredients. Furthermore, we test the quality and potency of every ingredient that enters our facility. 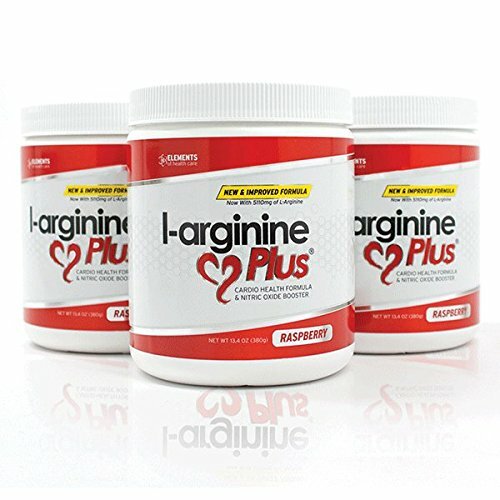 L-Arginine Plus is the most EFFECTIVE L-Arginine product on the Market! Give us 2 weeks and you'll be surprised...and so will your doctor! If you have any questions about this product by Elements of Health Care, contact us by completing and submitting the form below. If you are looking for a specif part number, please include it with your message.